Contains Milk, Soy, Almond, and Peanut. Processed on equipment that also processes Wheat, Egg and Tree Nuts. 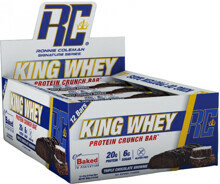 Protein Blend (Whey Protein Isolate, Whey Protein Concentrate), Vegetable Oils (Palm, Palm Kernel, Soybean), Soy Isolate, Vegetable Glycerin, Sugar, Peanuts, Brown Rice Flour, Water Collagen, Maltitol, Corn Syrup, Salt, Natural Flavors, Reduced Mineral Whey Powder, Soy Lecithin, Cocoa, Mono and Diglycerides, Whey, Vitamin A Palmitate, Beta-Carotene, Tapioca Starch, Potassium Sorbate, Almond, Sucralose. Protein Blend (Whey Protein Isolate, Whey Protein Concentrate), Vegetable Oils (Palm, Palm Kernel, Soybean), Soy Isolate, Vegetable Glycerin, Sugar, Maltitol, Cocoa (Processed with Alkali), Water, Collagen Brown Rice Flour, Corn Syrup, Natural Flavors, Salt, Mono and Diglycerides, Whey, Vitamin A Palmitate, Beta-Carotene, Soy Lecithin, Tapioca Starch, Potassium Sorbate, Almond, Peanut, Sucralose. 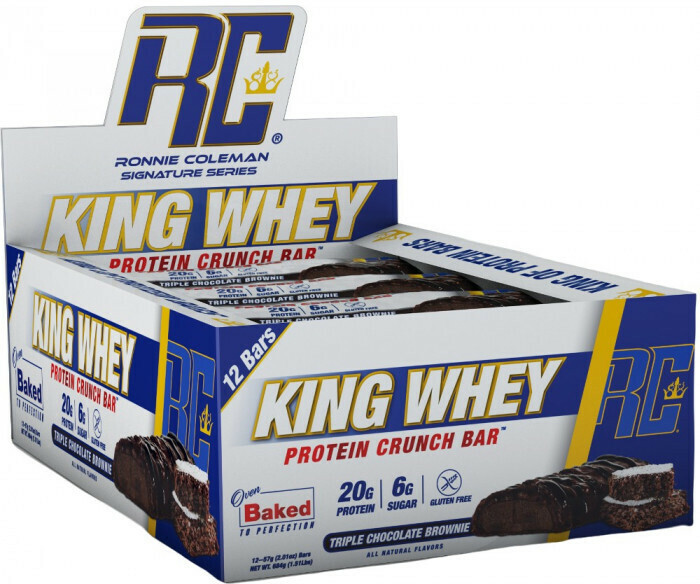 Nov 08, 2017 Ronnie Coleman King Whey Crunch Bars: New Protein Bar King in Town?